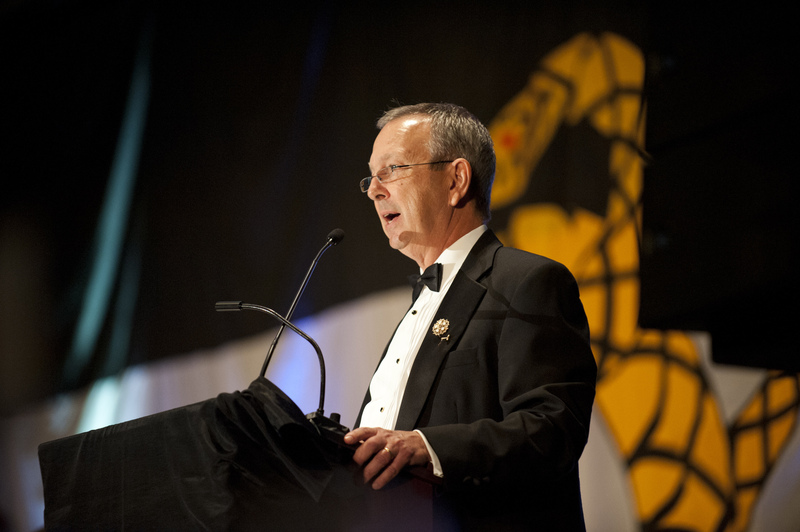 After announcing a new theme for the biennium, Regent Joe Francis (Oklahoma State) talks about the High Council’s ambitious agenda, including what fraternities must do to remain relevant over the next five years. Your inauguration speech in Nashville referenced a walk you took with some fellow volunteers during the 2007 College of Chapters in Lexington. What has been the significance of this walk in setting the course of the fraternity since then? That walk proved to be a turning point in my willingness to serve at this level. That walk was impromptu and developed without plan. In hindsight it’s interesting that how all three of us – Robert Durham, Lee Perrett, and me – have or will serve in the role as Regent. It’s significant to note that we started out by talking about our vision for what the fraternity could be. It was on that walk that we realized a like-mindedness that we all wanted our fraternity to be committed to having the strongest chapters on every campus where we operate. Our strength as a national organization, we all agreed, relies on the strength of the collegiate chapters. During this walk around the Washington and Lee campus we ended up verbalizing what I had felt for a number of years on the local level. I thought that if there is this focus on chapter strength then I might be able to offer valuable service to the fraternity because we followed this same mindset at the local level with my own chapter. The message of chapter excellence started with Robert’s term as Regent, and the focus gained momentum through Charlie’s term and continues today. How would you describe the Bound by Honor theme for those not in attendance in Nashville? The chapter excellence mindset focuses on what excellence looks like at the local chapter level. The concepts of bound for excellence and bound by honor are not mutually exclusive – those commitments are intertwined. Within the excellence imperative is an inherent sense of honor. If we provide an ethical chapter environment it must be based on our core values. Given all that’s going on with higher education and in society, bound by honor and the work of the Due North Task Force are critical. Our values of Love, Honor, and Truth must guide everything we do. What advice would you offer to a collegiate officer with hopes of transforming a struggling chapter? Where does he begin? If you have an opportunity to have dialogue with collegiate officers you have to focus on identifying their struggles. Their vision of struggle might be different than the actual source of their struggle. You have to remember we are working with officers who are college age men. Get them to verbalize what they are struggling with. They need to be honest about their deficiencies, and then set clear and attainable goals for improvement. What about the officer of a Rock Chapter? How does he inspire his chapter to avoid complacency? Every chapter can improve – whether a new colony, a struggling chapter, or a perennial Rock Chapter. That’s always been my mode of operation – raising the bar. An additional GPA point, stronger philanthropy, a better advisory board? Every chapter has a chance to be better no matter how good they are now. I always ask chapter officers, How will you do this job better than it’s ever been done? I challenge chapter officers to do something that will forever change their chapter in a positive way. The best chapter officers make it their own and raise the bar for that position. Then, you evaluate performance at the end of their term to see how they did. Your speech made reference to this idea at the national level. Could you talk more about your pivot from expecting excellence to sustaining excellence? What does that look like at the national level? Just as the collegiate chapters should evaluate their performance each year, so must the national organization – from the board level to the staff level. If you don’t constantly evaluate your programs you’re going to miss opportunities to improve or to remediate deficiencies. Strategic planning is a must. There needs to be transparency and dialogue. Reporting on milestones and exceptions is critical. How can we reassure chapters that their performance will be judged fairly and appropriately? Looking backwards often gives a clear vision for explaining current success. I’m proud of the process we go through with historical data to assess our chapters’ performance and identifying the underlying factors in their success. If you look back at Robert’s vision, the process for identifying, measuring, and remediating deficiencies – each stage followed a logical progression. There was never an intention or a desire to close deficient chapters. It was an opportunity to measure and remediate. When you do that you give them a chance to tell us how they are performing. If this process reveals areas of concern, the logical next step is to explain. We offer counseling and feedback, remediation and action plans. These are all consistent with a plan to improve and make chapters stronger, not plans to close small or struggling chapters. Look at the record number of Rock Chapters. And look at the very small number of chapters that have not turned the corner. That’s the message: until you have been handed a mandate to improve, you’re not going to see movement in the right direction. There was a concern that all chapters needed to fit a certain mold and look a certain uniform way. But that concern was unfounded. The focus has been on chapter strength and that mindset has now been institutionalized in our fraternity’s DNA. Each chapter is expected to be strong or on a path to reach that status. From your observations, what characteristics do the best chapter officers all have in common? The best chapter officers all have a strong sense of personal ethics. They have clear and inherent understanding of right from wrong and they are willing to act courageously if the situation arises. The best chapter officers are strong in their approach, but they find a way to earn the support of the chapter. They’re organized and smart with their time. Effective officers tend to be mature for their age. They’re able to communicate their vision and their goals, and they build a coalition within the chapter to achieve these goals. How did Tom Mason become a mentor and hero to you? What has he taught you? He modeled alumni service in the best possible way. There was nothing beneath him. He is the type to roll up his sleeves and do whatever it takes to make the chapter as good as it could possibly be. When I was a young alumni advisor I didn’t know what that level of service was supposed to look like. In hindsight, I realize now how much his example influenced me. I’ve tried to mirror him, the way he conducts himself. As a fellow attorney, I’ve also admired his commitment to ethics and integrity. He is the true definition of a mentor for his ability to bring out the best in the people around him. Just last month he rallied the chapter alumni around the capital campaign and the attainment of the matching gift. 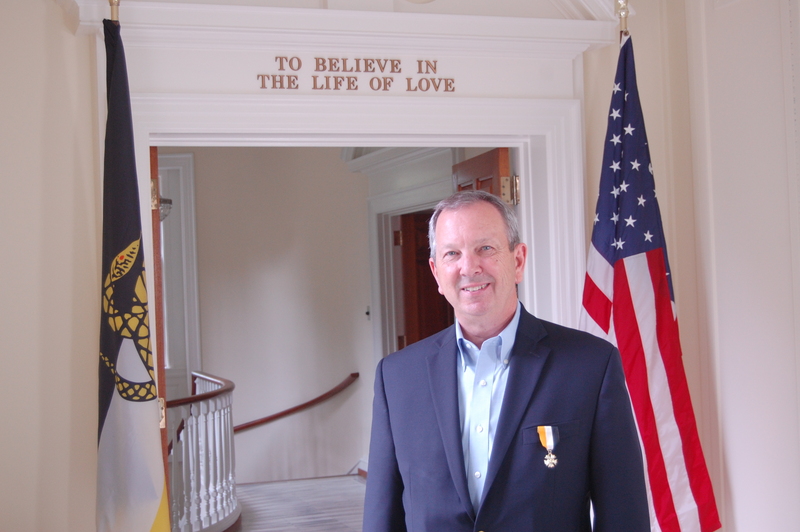 Above it all, Tom instilled in me a sense of obligation to serve the fraternity in whatever role I was called on to fill. This sense of obligation was the impetus behind the current High Council’s push to get outstanding alumni leaders to serve in leadership positions where they can really make a difference. We need our alumni to view fraternity at a broader level. When we have those people who can think strategically, we should encourage those members to think in terms of service at the national level. The most effective High Council members are those who would be hesitant because they are busy and have many other opportunities to serve. We need those who are equipped to serve at national level. A lot of the time those people have to be encouraged. It wasn’t my aspiration to do this, but I felt an obligation. What must fraternities do to stay relevant in the next 3-5 years and beyond? What higher education looks like, and what it could look like in the future, will be totally different than what I experienced as an undergrad. As long as we focus our programs on living our values and teaching ethical leadership then we will be providing a positive, out-of-classroom experience for the young men who seek to join our brotherhood. Given all the scrutiny Greek organizations are under now, we have a unique opportunity to demonstrate what we stand for and provide an experience that is unsurpassed by other groups. When you look at lifelong brotherhood and ethical leadership growth experiences, those are very powerful opportunities. That experience can be powerful in a young man’s life. We want to develop ethical leaders who in turn become better elected officials, citizens, husbands, fathers, etc. We’ll be offering something that’s not only relevant but also positive and powerful. As the classroom experience continues to evolve in the direction of online remote learning, face-to-face interaction will become increasingly important for developing young leaders who can be effective in the real world. Our LEAD Program needs to be mindful of these changes and visionary in our approach to providing this opportunity to interact with other students. What are the most critical issues facing higher education right now? How can fraternities be the driving force behind solving these problems? Higher education has come under increasing scrutiny lately for a number of reasons, including safe environments, pressure to control ballooning costs, foster an environment of inclusion, and comply with accreditation standards. If we’re going to continue as a leading fraternity we need to step out in these arenas and be proactive. But these are complex problems and finding a solution to each one will require considerable resources, patience and resolve. At the board level, we are taking steps to do what we can to make sure we’re providing an environment conducive to a positive learning experience. The thing we battle in fraternities is the behavioral issues of a minority of our members. People always shrug their shoulders and say “Boys will be boys.” But we can’t settle for lazy excuses like that. Once we step foot into the world of Sigma Nu we are expected to conduct ourselves as men. What steps is the High Council taking to execute upon these goals? Part of the Due North Task Force will be refocusing our chapters’ attention on the fraternity ritual. We will focus on the role the Chaplain can play as the gatekeeper of ritual. It all goes back to my time working with past Regent Robert Maddox and focus on ritual. Show me a chapter that’s casual about ritual and I’ll show you a chapter that’s struggling with focus on our values. Ritual is a great tool that will return us to focus on our founding values.